Hi everyone! It’s my last guest designer spot for Neat & Tangled so far. 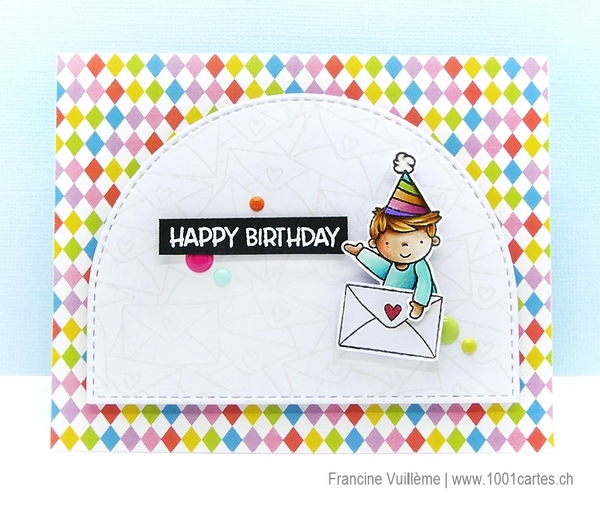 I started by creating a top-folded card base and adhered colorful patterned paper to the card front. Next, I stamped the Mail Background stamp in light gray ink to the semi-circular stitched shape. I adhered the shape to the card front using foam pads for more dimension. I stamped the background to a piece of white cardstock again but this time in black ink and cut just one envelope. I used a character from the Piece of Cake stamp set that I stamped in black ink, colored and cut with scissors. I fixed the sweet boy behind the envelope and adhered both to the semi-circular shape using foam pads. The sentiment is from the Little Monster stamp set and was heat embossed with white embossing powder onto a strip of black cardstock. To finish off my card, I added a few colorful enamel dots. I hope you’ve got inspired by this card. For more inspiration, visit the Neat & Tangled blog. This was my last guest spot so far. It was a pleasure to play with all these adorable stamps during the last three weeks. 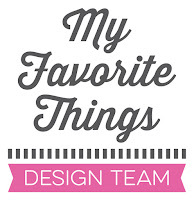 Thanks to the Neat & Tangled team for having me as a guest this month!